Hearing loss is a frustrating and sometimes life-altering condition that is often treated with hearing aids or cochlear implants. These treatments can frequently be helpful, but the degree of hearing improvement that they provide varies considerably. There is hope for the future, however. Researchers are investigating the use of stem cells to produce the vital inner ear cells that are needed for hearing and are destroyed in many (but not all) cases of hearing loss. Recent discoveries in this area are exciting. I've had sensorineural hearing loss for many years. My hearing aids provide some help, but a better way of dealing with the disorder would be wonderful. The stem cell studies interest me not only because I enjoy exploring the latest human biology research but also because the results of the research might one day help me. Anyone with noticeable hearing loss should visit a doctor. If the hearing loss is sudden or rapid instead of gradual, a doctor should be seen immediately. There are three parts to the ear: the outer, middle, and inner ear. Hearing loss can occur due to a problem in any of these areas. 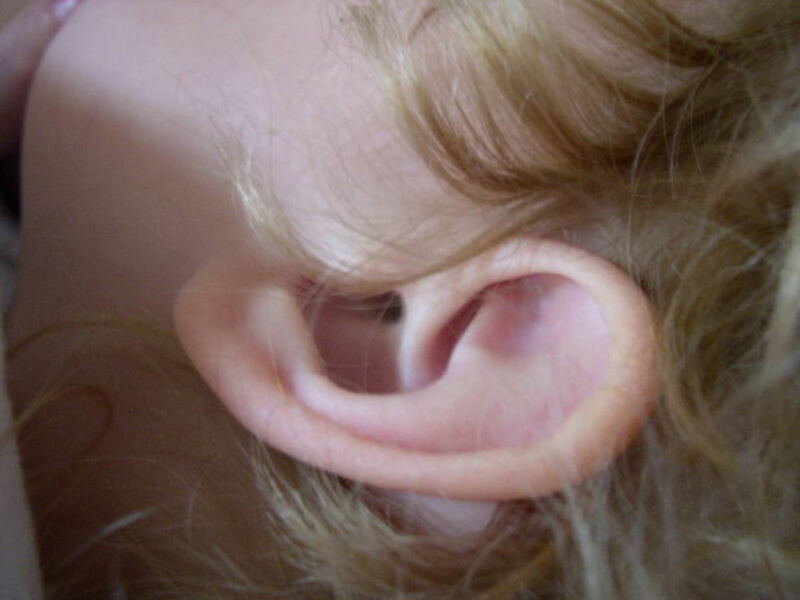 The visible part of the outer ear is called the pinna or auricle. The pinna collects sound vibrations and directs them along the ear canal, which is also called the auditory canal. 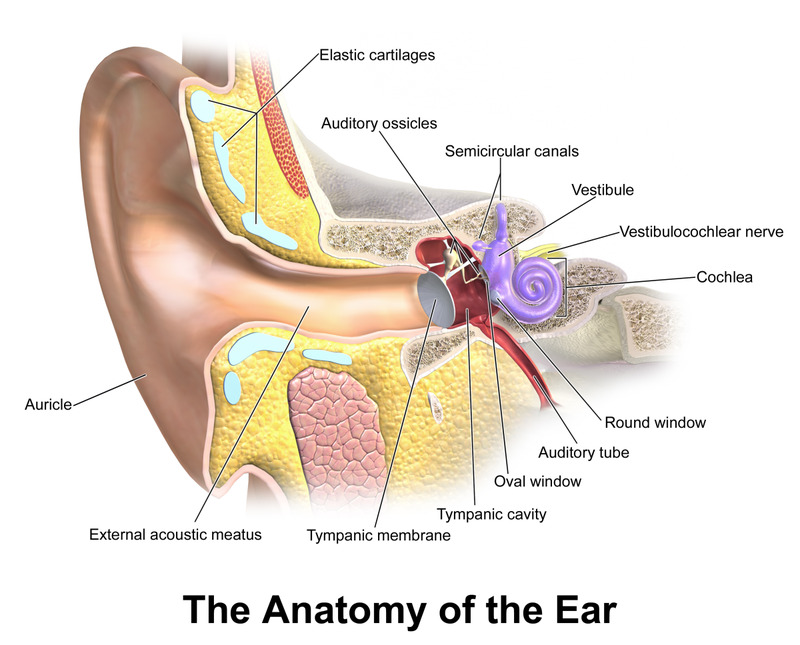 The eardrum or tympanic membrane is located at the end of the ear canal. The vibrations hit the eardrum and cause it to vibrate. The eardrum is connected to a series of three tiny bones known as ossicles. 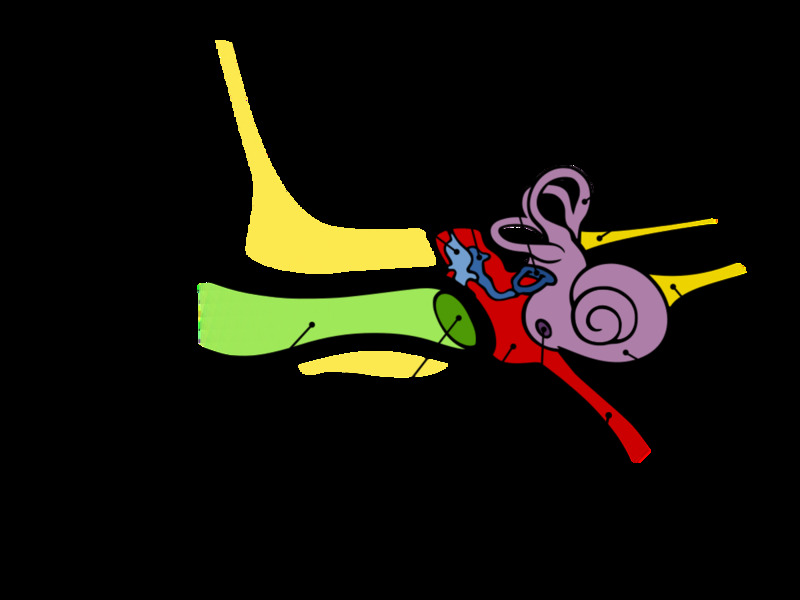 Vibrations travel from the eardrum into the first ossicle, which is known as the malleus or hammer. This transmits the vibrations to the incus or anvil which then causes the stapes or stirrup to vibrate. The second name for each ossicle arose due to its shape, which reminded earlier scientists of objects outside the ear. Like the outer ear, the middle ear is normally filled with air. The inner ear contains the cochlea, which is concerned with hearing, and the semicircular canals, which are concerned with balance. The cochlea is a coiled tube that looks somewhat like a snail's shell. Vibrations are transmitted from the stapes and into the fluid of the cochlea via a membrane called the oval window. The cochlea is a vital structure for hearing. Unlike the outer and middle ear, it does more than simply transmit and concentrate vibrations. 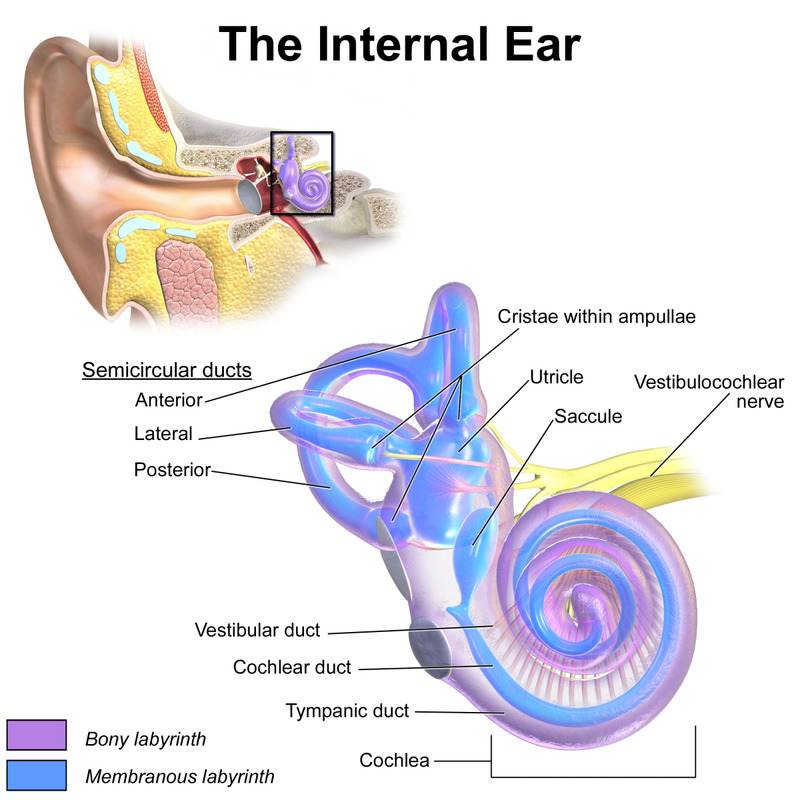 Sound vibrations are translated into nerve impulses inside the cochlea. The cochlea cells that convert the mechanical energy of sounds waves into the electrical signals of nerve impulses are known as hair cells. The cells are stimulated by the vibrating fluid in the cochlea. Individual hair cells are stimulated by specific frequencies of sound vibrations. The nerve impulses created by the hair cells travel along the auditory nerve (also called the cochlear nerve), eventually reaching the section of the brain that's concerned with hearing. Unfortunately, if hair cells are damaged or die, they can't be replaced at the moment. As a result, the person experiences some degree of hearing loss. As I describe below, however, stem cells may provide a solution to this problem in the future. A person with normal hearing has 11,000 to 15,000 hair cells in each ear. There are generally considered to be three types of hearing loss—conductive, sensorineural, and mixed. Conductive hearing loss arises when there is a problem in transporting sound vibrations through the ear canal, eardrum, or middle ear. 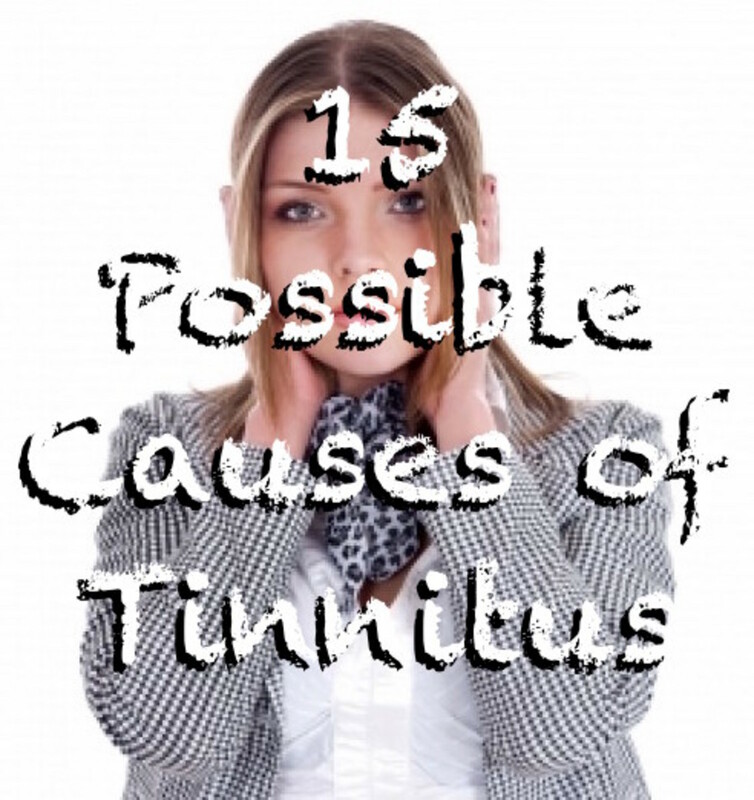 Examples of these problems include the buildup of wax in the ear canal, a perforated eardrum, and fluid collection in the middle ear. The fluid may hinder vibration of the ossicles. Conductive hearing loss can often be cured by a doctor. 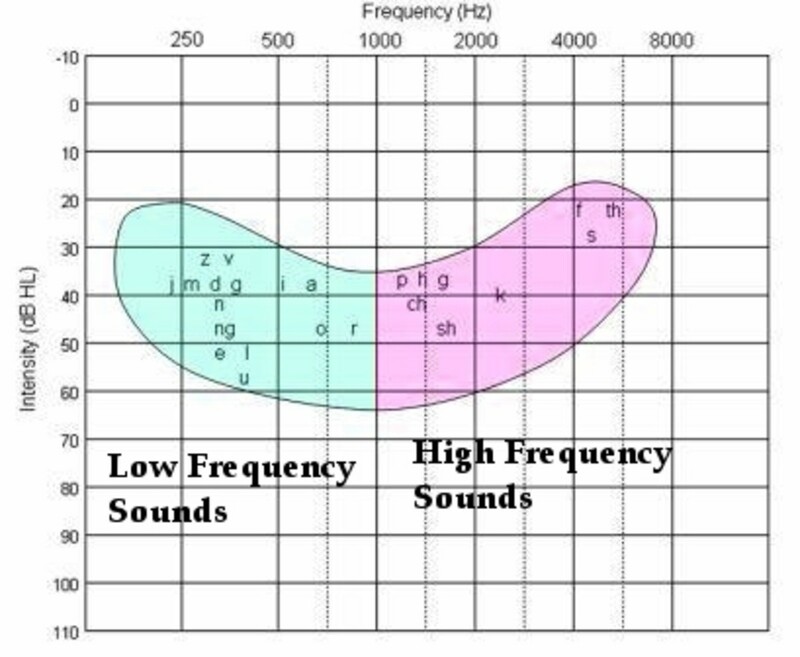 Sensorineural hearing loss or SNHL arises due to problems in the cochlea (giving rise to the first part of the disorder's name) or to a problem in the auditory nerve or the brain itself (giving rise to the "neural" part of the disorder's name). Sometimes hearing loss due to a brain problem is classified as auditory processing hearing loss. SNHL is more likely to be permanent than the conductive type. A person with mixed hearing loss has both SNHL and middle ear dysfunction. The middle ear problem may well be fixable, but the SNHL will probably be permanent. Hopefully stem cell therapy will mean that in the future we won't have to use the word "permanent" to describe most cases of sensorineural hearing loss. Sensorineural hearing loss is the type that might be improved by stem cell therapy. 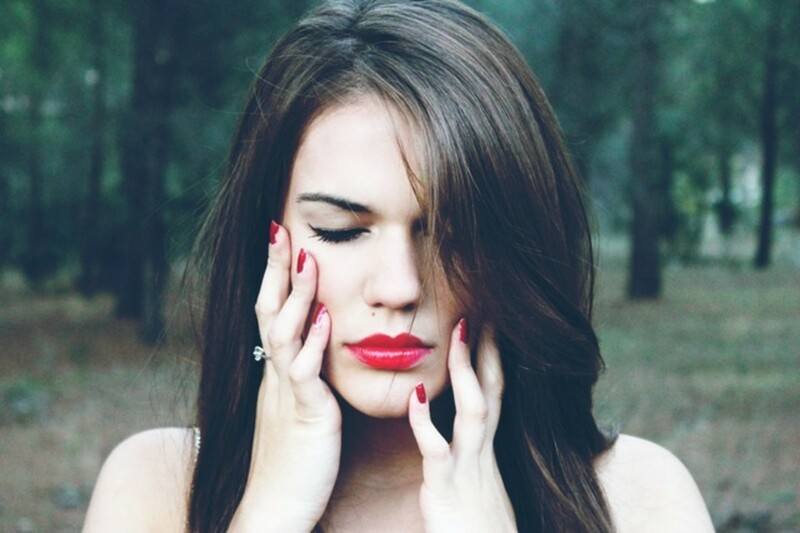 Specifically, the therapy may help SNHL involving hair cell loss. The disorder often—but not always—involves the destruction of hair cells in the cochlea. Some causes of the condition include the following. In some cases, as in mine, the cause of sensorineural hearing loss is unknown. Once certain diseases have been ruled out, the usual prescription for sensorineural hearing loss is a hearing aid. The benefits of the device depend on its abilities and on the type and amount of damage responsible for the hearing loss. For some people, hearing aids are very useful. They don't return hearing to normal, but they can make it significantly easier to interact with people and to enjoy and deal with everyday life. The devices are sometimes unsatisfactory, however. Some people find that although their hearing aids make sounds louder, they don't improve the understanding of speech. There are several styles of hearing aids. Some fit in the ear canal and are completely invisible apart from a small removal handle. Others are visible but not very noticeable. Some are more obvious unless hair covers the ears. The style that is chosen depends on the extent of a person's hearing loss, their manual dexterity, how self conscious they are, and what they can afford. A hearing aid consists of a microphone, a sound amplifier or processor (depending on whether the hearing aid is an analog one or a digital one), and a speaker. The microphone picks up sound vibrations from the environment, changes them into an electrical or digital signal, and sends the signal to the amplifier or processor. The amplifier makes the signal stronger. If the hearing aid is a digital one, the processor may make other adjustments to the signal. The amplifier/processor then sends the signal to the speaker. The speaker converts the signal into sound vibrations and sends them into the user's ear canal. Hearing aids have additional features, but they all operate via the basic mechanism described above. The user has some control over the settings of the device. In addition, within certain limits, an audiologist can change the settings on a hearing aid to make it more suitable for a patient's problems. If you get hearing aids, wear them regularly and don't give up on them too soon. The brain's ability to interpret the magnified sounds often improves with practice. In addition, the abnormal sound of people's voices that a new hearing aid user experiences generally weakens over time. Unfortunately, it's not possible for everyone to buy hearing aids with the best or most suitable technology or even to buy the devices at all. A single aid costs hundreds to thousands of dollars. If someone has hearing loss in both ears, as I do, it's hard to get by with only one aid. The cost of the devices may be a major obstacle to their use, depending on individual circumstances. Medical insurance plans may contribute to or pay for the purchase. Some plans don't cover the cost of the device or cover it to only a small extent, however. Another problem is that not everyone has insurance. 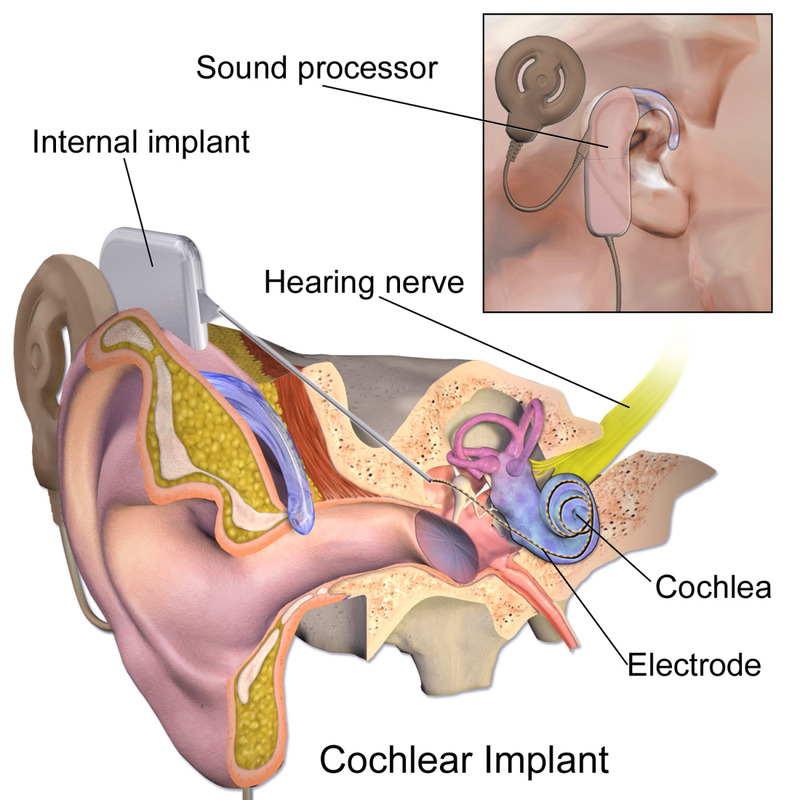 A cochlear implant may be offered to people who have severe sensorineural hearing loss. I have no personal experience with the devices. The implants are reportedly a great help for profoundly deaf people but don't produce normal hearing. The fact that the technology can partially substitute for a cochlea's function and send impulses along the auditory nerve that the brain can interpret is impressive, though. Despite the word "implant" in its name, the device has external as well as internal parts. The basic operation of the implant is as follows. A sound processor is worn behind the ear. This picks up sounds from the environment via a microphone and transforms them into digital code. The internal implant transforms the digital code into an electrical signal. The electrical signal is sent through an electrode into the cochlea. The cochlea sends the electrical signal along the auditory nerve to the brain. Unlike most of the cells in our body, stem cells are unspecialized and are capable of division. They have the wonderful ability to produce both more stem cells and the specialized ones that our body needs. This is why they are of such great interest to researchers. If we could activate them correctly, we might be able to replace damaged and missing body cells, tissues, and perhaps even organs. There are different types of stem cells. The ones from a very early-stage embryo (the blastocyst) are said to be pluripotent because they can produce any type of specialized cell in the body. Adult or somatic stem cells are more limited. They produce only a few types of specialized cells and are said to be multipotent. They are found in both children and adults, despite their name. Adult stem cells are less numerous than specialized ones and are inactive in some parts of the body. When a stem cell becomes active, it divides to make another stem cell and a slightly specialized progenitor cell. The progenitor cell produces cells that are even more specialized. The division process continues until the target cells are produced. Scientists have learned how to create a new type of stem cell that is proving to be very useful in research. They've discovered how to reprogram human skin cells so that they become pluripotent stem cells that resemble those from an embryo. The altered cells have the ability to produce any type of cell if they are stimulated correctly, including hair cells. They are known as induced pluripotent stem cells or iPS cells. They are two advantages to working with iPS cells instead of embryonic ones. The skin cells that are reprogrammed are obtained without destroying embryos. In addition, the cells can be obtained from the eventual recipient of the reprogrammed iPS cells or of the cells that they produce. 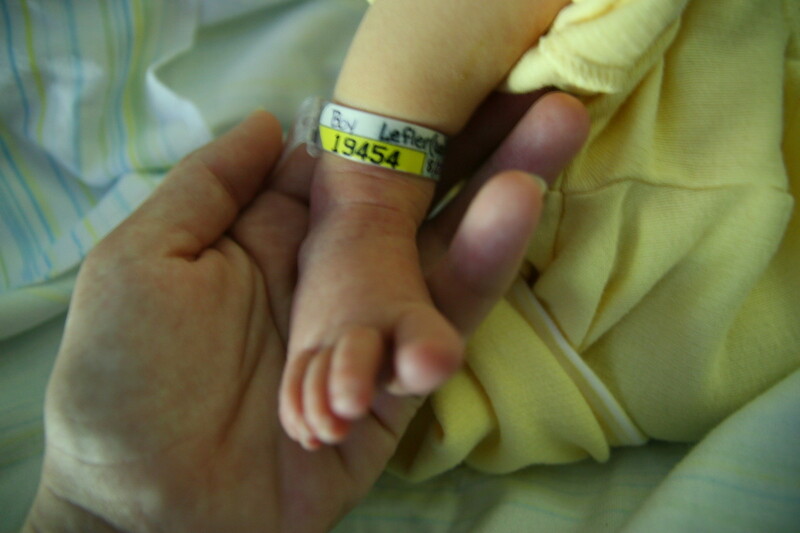 This reduces the chance that they will be rejected by the recipient's body after a transplant. The body generally rejects cells that don't belong to it. The regeneration of cochlear hair cells could be of great benefit to people who lack them. Multiple groups of researchers are working on the goal of producing hair cells in the lab. They are also looking at two additional points that are important to consider. Any cells that they implant into the cochlea must attach to the right part of the structure and must be able to send signals to the auditory nerve. Stanford University runs a program called the Stanford Initiative to End Hearing Loss. One aspect of this initiative is an investigation of stem cell therapy. The researchers have already used mouse stem cells to produce new cells that "look and act very much like hair cells". The team is currently trying to create lab cultures of human hair cells from iPS cells and say that the process is "promising". In addition, they are investigating the use of gene therapy and molecular (drug) therapy for restoring hair cells and hearing. The Harvard Stem Cell Institute is also trying to create hair cell cultures from stem cells and to discover how to effectively implant them in the ear. They say that they have identified the stem cells that can become hair cells as well as the molecules that can stimulate this process. They have already found drugs that stimulate hair cell regeneration and partial hearing restoration in deaf rats. The researchers have also been able to stimulate stem cells to change into auditory neurons in mice. Nerves are made of neurons. The auditory neurons that have been made have connected to mouse hair cells and improved the hearing of the animals. Birds and some other vertebrates regenerate inner ear hair cells that are destroyed. Mammals don't. Researchers are exploring the reasons for this difference. In early 2017, a team of researchers from Brigham and Women's Hospital and other institutions announced the success of another strategy for regenerating hair cells. The team is particularly interested in the fact that some vertebrates can regenerate hair cells while humans and other mammals can't. The researchers started with cells from the ear called cochlear supporting cells. These cells made a chemical called Lgr5. The scientists treated the cells with a mixture of drugs that stimulated critical processes in the cells. As a result, the cells produced progenitor cells, just like a stem cell does. (Lgr5 has been found in some stem cells.) The progenitor cells went on to produce hair cells. The process worked in cells from mouse, non-human primate, and human tissue. The researchers say that the process also worked in "intact cochlear tissue". In the video above, the scientist from UC San Diego also mentions regeneration of hair cells from the cochlear supporting cells that lie underneath them. I find this idea especially exciting. It could mean that we do have the cells required to regenerate hair cells, but for some reason the process needed to stimulate regeneration no longer operates in our body. The research into creating hair cells in the lab and in the bodies of animals is intriguing. Effectiveness, longevity, and safety of the new cells need to be explored before the therapy is used for humans. In addition, large numbers of hair cells need to be produced, since so many are found in an ear that's functioning normally. Although more work needs to be done, the future looks both interesting and hopeful for people who have hearing loss due to the destruction of hair cells. Diminished hearing can be a big hindrance in life, especialy if the condition isn't helped in any way. I hope that stem cell and other therapies lead to the successful implantation or regeneration of hair cells as well as the restoration of hearing. I also hope that the technology is made available to as many people as possible. Are researchers performing human trials in regards to hearing loss and stem cell therapy, and if so how does one apply to test their process? I did a quick Internet search and found that there do seem to be some clinical trials for stem cell use in hearing loss in progress or soon to start in the United States. The news is exciting, but anyone who is considering participating in a clinical trial needs to be very careful about what they will face. The nature of the agency carrying out the clinical trial, approval of the trial by a federal agency such as the FDA, the procedures being used, and any risks involved need to be considered very carefully. 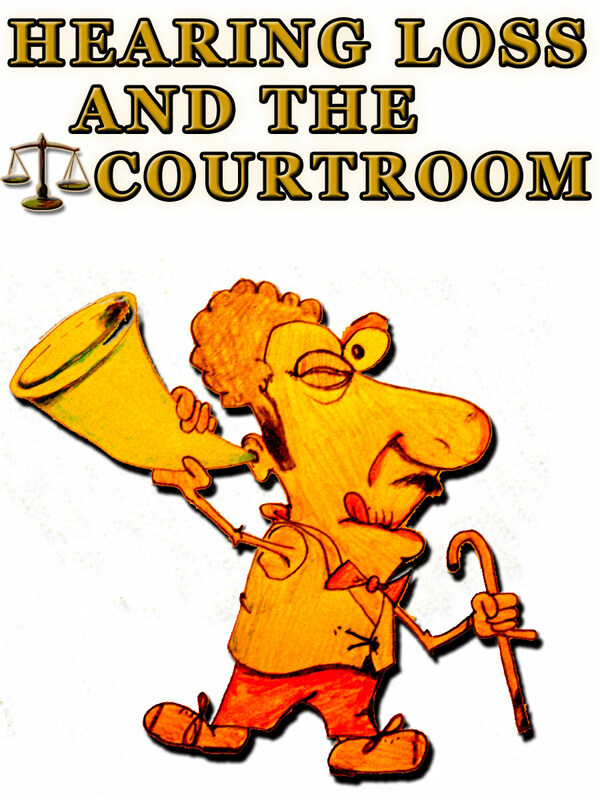 Also, it’s important that the person discusses participation in the trial with their doctor and audiologist. Stem cell treatment offers hope for many medical problems. Unfortunately, some people are making unproven claims about the abilities of the cells and providing useless and perhaps unsafe treatments. If someone decides to participate in a clinical trial, they must make certain that they participate in one that is approved by a health regulation agency run by the government of their country. Thanks for the comment, Dianna. I hope your sister gets effective help and that even better treatments for hearing loss are discovered. My sister has recently lost her hearing and is scheduled for an MRI in October. I will pass on the positive new procedures available to her. Thank you for this wonderful information. Hi, Vellur. It would definitely be great if stem cell research lead to a treatment for hearing loss! Thanks for the visit. Hearing aids have become advanced and more comfortable for wearing. If stem cells research could lead to preventing and treating loss of hearing that would be great. Thank you for sharing an interesting and informative article. Thank you very much for the kind comment, Jackie. I'm sorry about your nerve damage. It's possible that in the future there will be a way to repair the damage. There's a lot of research being done in relation to nerve problems. This is so thorough Linda, would make an excellent informative pamphlet on the market! My only ear problems with my ears has to do with nerve damage, wish there was something permanent to be done for that. Thank you very much for the kind comment and the share, techygran! I appreciate your visit a great deal. Linda, this article explains hearing, its loss and stem cells in a clear way that even my non-scientifically oriented mind can make sense of. I wish you had been my biology teacher! I am sharing this with friends on Facebook. Thanks, DDE. Yes, unfortunately some older people do develop a hearing problem. It's sad that some younger people do, too. I hope new solutions for the problem are found. It is useful and well-informed. When people get older hearing becomes a problem. Hi, linfcor. Yes, it would be a blessing if the new discoveries help to restore hearing. The discoveries might help me, you, and many other people! Thanks for the visit. Great article.. I have a hearing loss. Right now I wear one hearing aid, but still miss some words. If this works, it would be a blessing for many. Hopeful. Thank you very much for the kind comment, ChitrangadaSharan. The present solutions for hearing loss in both younger and older people may not be perfect, though they can certainly be helpful. I hope that the technology improves and that there are new and more effective solutions in the near future. Excellent article and very informative! Hearing loss is common as we age. It's heartening to know that there are solutions and technology helps in so many ways. I am sure your well researched article will help so many with this. Thanks for sharing this wonderful hub! Hi, Peggy. Yes, the news is potentially exciting. I'll certainly be watching for new announcements related to the research! Thank you very much for commenting. What potentially exciting news for those with hearing loss. Hopefully in the near future stem cells will help alleviate and/or cure many diseases and disorders. I had no idea that some birds and some other vertebrates can regenerate hair cells. Amazing! I always learn something new when I read one of your articles. Thank you, Larry. I always appreciate your comments! Thank you very much for the comment, Manatita. Stem cells have so much potential. I hope they live up to their promise. An invaluable Hub for many. I have heard of the cochlear implants, but I believe that they are expensive. Would be interesting to see what man will do, say, in twenty years time. Stem cells are a big one these days and they are used in Leukaemia as well with varying results. The ear is very interesting. I hear that trace minerals, especially manganese, can help. Hope you get help in the future, Alicia. Another well-written and very informative article. Thanks for sharing the interesting information, Martie. I'm glad your granddaughter was helped. Unfortunately sensorineural hearing loss generally stays once it's developed and may get worse over time. I hope stem cell therapy is successful and ready for use as soon as possible. What a well-written and comprehensive hub about ears and the loss of hearing. I am so sorry you are one of the many unfortunate people who had suffered sensorineural hearing loss for many years, Alicia. I hope you don't have it any more. We hear more and more about stem cells and its reported benefits. I had the option last year to try stem cell treatment for the possible cure of osteoarthritis in the hips. Unfortunately my medical aid doesn't cover this treatment, as it is still too new with not enough evidence of success. 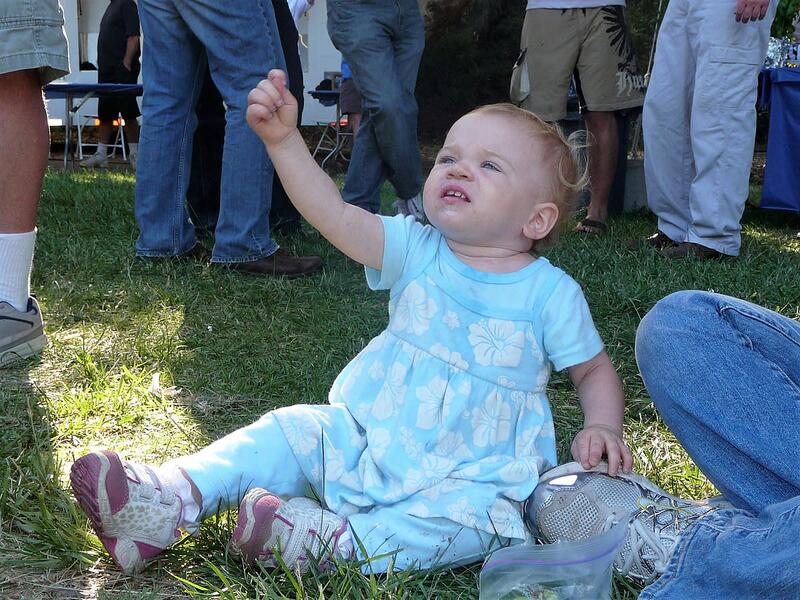 My granddaughter's deteriorated eardrums were repaired via Tympanoplasty. I hope she will not develop any further hearing problems. Hi, Dora. I hope the scientists are successful, too. Their discoveries could be very useful for many people. Linda, thanks for this comprehensive lesson on ears, hearing and stem cell therapy. Just the other day I was thinking how unfortunate it would be not to be able to hear "I love you." Success to the scientists in their efforts to regenerate the cochlear hair cells. Hi, Bill. Yes, medical technology can be impressive. There's room for improvement in some areas, though. Thanks for the visit. Great information! Technology is so remarkable with regards to things like this. I love how there are very few obstacles that cannot be conquered by technology with regards to hearing loss...even sight loss. Thank you very much, John. I appreciate your visit and comment. What a comprehensive and informative article in regard to hearing loss and the promising research into the use of stem cells to restore hearing. Great job on this, Linda. Hi, Flourish. Yes, the research does offer hope. 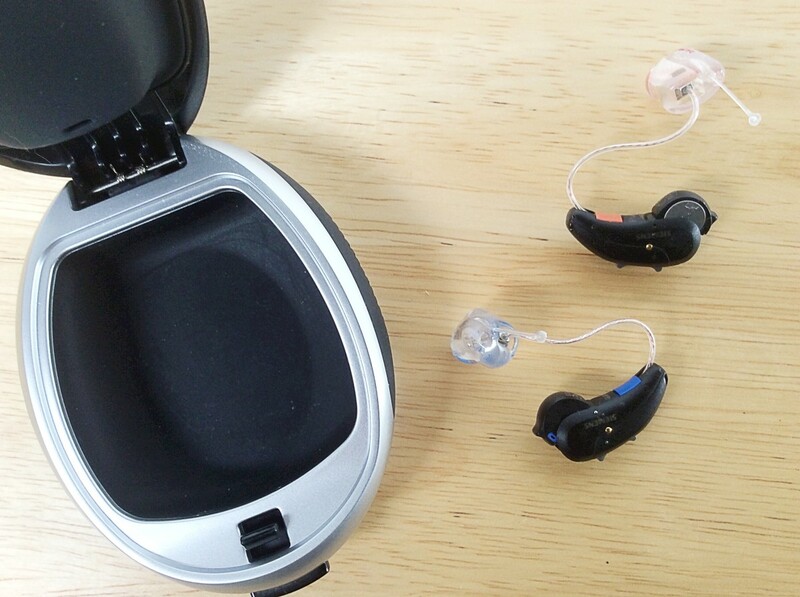 It's certainly needed for people who can't find a solution for their hearing loss. I hope the investigations lead to new treatments soon. My grandfather was extremely hard of hearing and my dad is, too. My dad was told his hearing loss wouldn't be improved much by hearing aids so he goes through life guessing what people are saying or just not hearing them correctly or at all. Now I am noticing changes in my own hearing. I certainly hope that improvements in technology can bring better quality of life to people with hearing loss. I'm all for stem cell research for many reasons. This line of research offers hope.